This afternoon I had a fun conversation with people on Twitter and on Facebook about which hot sauce to have with chicken wings, which I’ve never cooked before. In the morning I bought a huge bag of really meaty wings from the butcher round the corner from me for only £3. Flock & Herd are very good but quite expensive, so I am pleased to have found something cheap! Back to hot sauce. Thom Eagle, a brilliant writer and pickler from Darsham Nurseries in Suffolk suggested a recipe where you blitz chillies, stalks and all, add 2% of the weight in salt, leave for a few days to ferment and then bring to more of a sauce consistency with cider vinegar. Fellow Peckham-resident Euwen, (@tehbus) directed me towards his favourite Buffalo wings sauce recipe and then on Facebook, textile designer and lifestyle blogger friend Nancy Straughan also showed me a Buffalo wing sauce. Journalist and brilliant cook Alicia Kirby linked me to a Korean fried chicken recipe using gochujang (a mix of miso and chillies), which looked delicious, however though it involved more new ingredients than I could get hold of when I got home at 10pm. My friend Dani over in America recommended some Southern food cookery books, which I’ll be looking up shortly. In the end I made a version of the one that Nancy recommended, modified for one person, and using the ingredients that I had – I missed several things that her recipe includes and used a different chilli sauce, but it was **really** good and I want to make it again ASAP. I improvised the cooking method for the wings, which came out juicy and tender. The salad was an excellent, fresh and sweet palate cleaner and an ideal foil for the hot, vinegary, buttery sauce. I ate this gleefully while watching Masterchef The Professionals, having found out to my delight, that it started last week and that I could watch three episodes on the trot! I love the bizarre things people cook, learning from the skills tests, and tutting at Greg Wallace. Heat the oven to high, around 200 C. Toss the chicken wings in the cornflour with some salt and pepper, and then the sunflower oil. Bake for 15 minutes. Meanwhile, melt the butter in a pan on a medium heat. Add the rest of the ingredients and whisk until smooth. Take off the heat before it boils. Take the wings out of the oven and toss in around a third of the sauce. Put back in the oven for ten minutes, opening the oven to turn around in the sauce after 5 minutes, with the heat turned down to a medium temperature, around 170C. Remove from the oven – check they are cooked, by cutting to the bone of a large piece – there should be no blood. Place on a warmed serving plate and top with the rest of the sauce. Mix the finely sliced fennel with a pinch of salt and the oil. 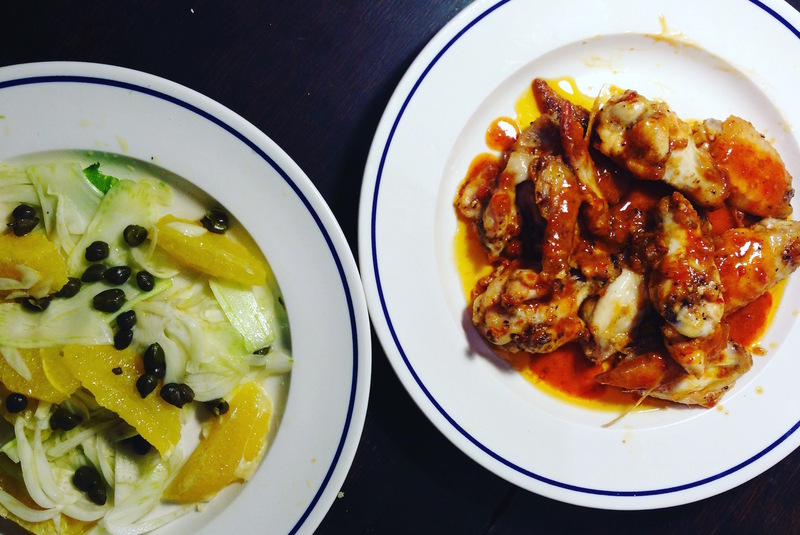 Arrange on a plate with the orange segments, sprinkle over the vinegar and the capers and a little more salt.